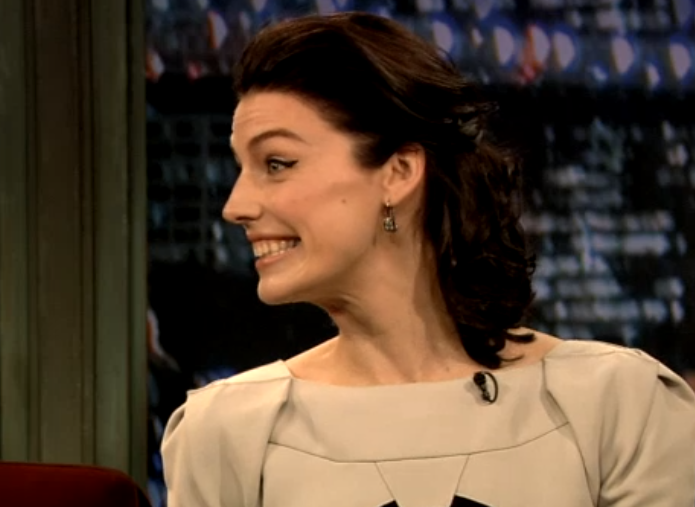 Jessica Paré was recently a guest on Late Night with Jimmy Fallon. Ms. Paré plays Megan Draper and wife of Don Draper (Jon Hamm) on AMC's "Mad Men". Early on Jimmy says, "...This, this is your first late night show?" and Jessica answers, "It is my very first. I'm really excited and a little terrified". This image is captured at 0:17 seconds as Ms. Paré looks away from Fallon and takes on a nonverbal cluster of fear. As she said - she really is a little terrified. Her neck in particular shows a mild tenting-up of the skin at the juncture of her neck and jaw. This is a sign that the platysma muscle is mildly tightened and is highly characteristic for fear. The corners of Ms. Paré's mouth are also pulled backwards. In higher degrees of fear the corners are pulled back and downwards. The actress's eyelids are also opened wider than her normal baseline and her entire forehead muscle (inner and outer) is contracted - elevating her eyebrows. Again, this is an expression of mild fear. The eyelids would be open wider with greater levels of fear. The forehead would also be more furrowed and the eyebrows lower in more extreme fear. This is a great example of the subtle "neck of fear" and "mouth of fear" seen throughout the day in every business, law and medical office in every city. How many times have you missed this nonverbal at placed yourself at a disadvantage (but never realized it)? This second image is classic embarrassment after Jessica describes her real-life mother performing imitations of her T.V. character - Mrs. Draper's "Zou Bisou Bisou" at family gatherings. Paré's body language displays a cluster of blushing, looking down and away, making a sincere smile/laugh, with a bilateral eyelid closure and covering her mouth. What other body language of anxiety does Jessica Pare exhibit in this video? Can you spot Jimmy's lie?